On 14 November, key Belarusian arms exporter Beltech Export signed a deal with the United Arab Emirates (UAE). The Belarusian firm has agreed to maintain and modernise Emirati radars. This means that Minsk has successfully entered a new market, as it has never sold air defence-related products or services to Arab monarchies before. This news, along with news of further remarkable international contracts entered into by Minsk this autumn, illustrates the silent evolution of the Belarusian defence industries. They have not only succeeded in developing new products – anti-tank weapons, rockets, missiles, armoured vehicles and others – and started selling them. They are also establishing cooperation with major foreign defence firms like the Chinese Long March aerospace corporation or the Turkish Roketsan missile firm. Such actions illustrate a promising development toward building autonomous national military industries and making the Belarusian state more economically viable. The latest Belarusian deal – assessed at $15.7m – with the UAE military at the Dubai Airshow in November was widely seen as a coup for Minsk. The Dubai–based Khaleej Times has even listed it among the major contracts concluded at the Dubai Airshow 2017. 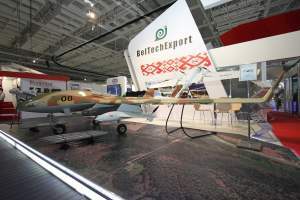 After all, Belarus had participated in the airshow for the first time, yet Arab countries of the Persian Gulf were seen reluctantly buying non-Western defence products and services. In addition, this February, Beltech Export won a contract worth some $14.4m to supply the Emiratis with spare parts, repair services and technical assistance for its Russian-manufactured BMP-3 armoured vehicles. Minsk not only won the contract over Russian arms firms, but the Belarusian offer has political implications, as well. After all, the UAE would currently prefer to avoid working with Russia yet it needs parts and support for its BMP-3s deployed in the Saudi-led intervention in Yemen. Belarusian defence firms, and the state agencies responsible for them, have been regularly meeting their Emirati counterparts for around two decades. The latest conference of the defence industry officials from the two countries took place on 15–16 October. Belarusian president Lukashenka also paid a visit to the UAE between 25 October and 6 November, ostensibly to promote trade between the two countries, including trade in military equipment. These contacts seem to have borne fruit. Moscow-based Nezavisimaya Gazeta reported that last year Minsk Wheel Tractor Plant (MZKT) successfully received an order for tank transporters without any tender. The delivery was due this year yet no details on the contract have yet been made publicly available. The MZKT has been selling such equipment to the UAE since the early 2000s. Minsk also relies on arms deals to advance relations with Middle Eastern countries. It therefore came as no surprise that in 2013 Raman Halouchanka, the deputy chairman of the Belarusian state military industrial committee, was appointed as the Belarusian ambassador to the UAE. Forthcoming breakthrough in relations with Turkey? Some unprecedented results have also been achieved in relations with Turkey. Şuay Alpay, Turkey’s deputy defence minister, paid a visit to Belarus from 23 to 26 October. The Belarusian media has kept silent on the content of these negotiations. However, Turkish daily Yeni Ufuk reported that the Turkish defence official had expressed his satisfaction with the cooperation between Turkish and Belarusian companies on “rifle sights, inertial navigation systems for howitzers, electro-optic equipment, avionics, satellite cameras and land vehicles”. Indeed, he brought to Belarus a large delegation which included not only state military industries officials, but also managers of leading Turkish arms firms. Among them were Aselsan (radios, defence electronic), Roketsan (rockets, missiles, satellites), BMC (trucks and tactical vehicles), MKEK (ammunition and various weapons systems). Although Minsk and Ankara first signed an agreement on defence industrial cooperation in 1998, their cooperation effectively started in the late 2000s to coincide with Turkish president Erdoğan’s launch of his assertive foreign policy. At the same time as starting new cooperation projects, the Belarusian government has worked to advance most of its old partnerships, most importantly the partnership with China. The President of China’s leading Aerospace Long-March International Trade Co., Shi Kelu, came to Minsk on 23 October. Minsk has for many years worked with Beijing in the aerospace arena, even choosing to launch its satellite with Chinese and not Russian help. The Belarusian government has also started its missile programme with China’s assistance after being denied new missile systems by the Kremlin. The business and political interests of Minsk and Moscow collide in the most explicit way in former Soviet nations, especially in terms of relations between Belarus and Azerbaijan. 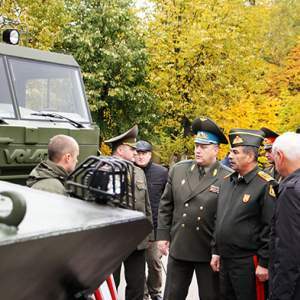 On 8–10 October, Minsk welcomed Azerbaijani defence minister Zakir Hasanov. A military expert close to the Azerbaijani defence ministry Yaşar Aydəmirov told several Azerbaijani media outlets on 13 October that Baku should purchase Belarusian-made Palanez multiple-launch rocket systems. According to him, given Azerbaijan’s specific geographic and other advantages, Palanez systems would serve as an adequate response to Russian-made Iskanders deployed by Armenia. Belarusian military technical cooperation with Central Asia reveals the same tendencies for entering new markets despite Moscow’s disapproval. A case in point is the recent move towards cooperation with Uzbekistan: a country which severed most of its ties with Belarus in the early 2000s. 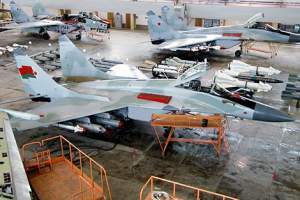 On 4 October, Moscow-based Kommersant daily revealed that the Belarusian 558th Aircraft repairs plant began the overhaul of four Su-25, close air support aircraft and four MiG–29, fighter jets owned by Uzbekistan. Moreover, there are reports that Belarusian firms are to receive contracts for the overhaul of another eight aeroplanes of this type. The 558th Aircraft repairs plant, based in the Belarusian city of Baranavichy, has signed the contract with Uzbekistan despite the fact that the latter had negotiated with the Russians concerning the overhaul of its aircraft in the spring of this year. Kommersant quoted a source from the Russian defence industries as saying that this deal between Minsk and Tashkent has caused “some consternation” in the Russian arms industry. Uzbekistan is not the only post-Soviet country which has begun to choose Belarusian firms. From 24 to 26 October, the Commander of the air defence forces of Kyrgyzstan, Kylychbek Aydaraliev, also visited Belarus to discuss the possible overhaul and repairs of Kyrgyzstani aircraft, helicopters and air defence equipment in Belarus. Minsk has to constantly take into account the Kremlin in doing arms business as Moscow dislikes the recent successes of its ally in diversifying its international contacts. Russian right–wing Regnum news agency published a commentary entitled “Mission impossible: Belarus seeks an alternative to Russia for its defence industries” on 14 November. Therefore, although Minsk hardly considers the development of its defence industries in cooperation with non-Russian partners or sales to new markets as a move aimed against Russia, the Russian establishment now sees such deals in exactly those terms. Yet the Belarusian government is forced to act in this way in order to survive both politically and economically. Not only because Minsk would become a Russian satellite otherwise, but because the Kremlin is actively substituting Belarusian defence products and continues to insist that Minsk must sell its defence firms to Russia lest they go bankrupt without Russian support. So, Minsk has endeavoured to seek and find its own solutions: the examples above serve as irrefutable proof of that. On 17 November, Belarusian President Alexander Lukashenka participated in the opening of the new BelGee automotive plant, which will produce Chinese Geely cars. The venture is the largest passenger car enterprise in Belarusian history. Lukashenka also announced a draft decree to create incentives for Belarusians to buy domestically manufactured cars. In August, local developers presented the first Belarusian electric car. Lukashenka personally advocates the development of domestic electric car manufacturing. Although the market for electric vehicles is still young, it is growing highly competitive—even within the borders of the Eurasian Economic Union, of which Belarus is a member. As the Russian government is gearing up to take unprecedented measures to support its own electric car industry, Belarusian developers will have to make serious, well-thought out efforts to become competitive. On 17 November, during his visit to the new automobile plant BelGee, Presdient Lukashenka announced that the government is drafting a decree to encourage Belarusians to buy Geely cars built in Belarus. The Belarusian-Chinese BelGee plant, which produces passenger cars under the Chinese Geely brand, was established in 2011. Lukashenka says the state aims for as many Belarusians as possible to buy domestically produced cars. This is going to be the largest passenger auto project with foreign backing in Belarus’s history. It should be noted, however, that previous projects have not fared well. For instance, over a five year period, the Iranian company Samand produced about a thousand cars which were mainly sold to state organisations. Ford, which manufactured cars in Belarus in the ’90s, did the same amount of sales in a year. The authorities closed both operations, because the enterprises did not meet sales expectations. For 2018 and 2019, the government expects production and sales to reach 25,000 and 35,000 cars respectively. “But we have [still] another goal—to produce more. We will double capacity. We will sell 60,000 cars and then set a goal of 120,000,” the Belarusian president said. To be profitable, the plant has to sell at least 35,000 cars a year. However, the Belarusian market cannot absorb even a small fraction of this volume. According to data from the Association of Belarusian Car Owners, over the past 7 years purchases of new cars peaked in 2014. That year, Belarusians purchased around 50,000 vehicles, of which 20,000 were bought in Russia, where prices were attractive at the time. These figures suggest the absolute maximum domestic dealers can expect to sell is around 30,000 new cars. Moreover, the locally assembled Geely will have to compete with other more reputable, global brands. This seems an almost impossible task for the enterprise, as Geely remains outside even the top 25 most popular car models in Belarus, according to 2016 purchasing statistics published by TUT.BY, an online news portal. BelGee strategists say they are aware of the situation. They claim that 90 per cent of new Geely cars will be exported to Russia. But there, they will face virtually the same problem. Will Russians accept the Belarusian Geely? Chinese automaker Geely plans to make annual global sales of 2 million cars by 2020. It expects to sell 170,000 cars abroad—80,000 of this number in Russia. However, so far Geely sales remain unimpressive. Worryingly, over first 9 months of 2017, Geely’s most negative sales trend expressed itself on the Russian market. Purchases dropped by 55.4 per cent (1,693 Geelys out of a total 1.13 million sales for the total Russian market) compared to the same period in 2016. Sergey Udalov, the Deputy Head for Autostat, a consultancy, was quoted by Reuters saying the Belarusian plant will not be able to sell 30,000 cars per year. “I think it is possible to increase sales to 10,000, but I do not think they will be able to sell more,” said Udalov. In fact, it is Russia that supplies Belarus with cars. Russia manufactures a dozen of global brands, including BMW, Kia, Cadillac, Chevrolet, Renault, Volkswagen, Ford, and Hyundai. For example, 90 per cent of cars sold in Belarus are assembled in Russia. How Belarus will compete with these Russian produced, global brands within Eurasian Economic Union markets remains unclear. Indeed, since the 90s, Belarus has failed to establish a single successful foreign car manufacturing venture. Moreover, a strategy to sell cars to Russia is of questionable value in the context of Belarus’s 30-30-30 goal. This goal intends to even-out Belarus’s export volumes between the EU, Russia and Asia in equal shares, and thereby free it form excessive dependence upon the Russian market. If 90 per cent of cars are intended for the Russian market, it appears the 30-30-30 target does not apply to Geely cars. 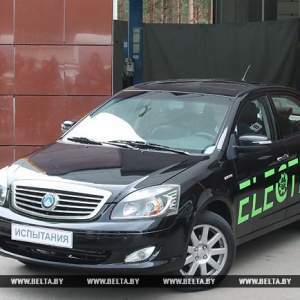 Another issue for Belarusian Geely advocates is the global transition towards electric cars. In the coming decade, electric cars may reach prices comparable to their gasoline-powered counterparts and sales are projected conquer a larger share of the global market. For short-term, the production of petrol-engined Geelys can be justified by huge oil reserves and the absence of legislative incentives to sell electric vehicles in both Russia and Belarus. At first glance, Belarus appears to be taking an approach that risks lagging behind global trends in the very near future. But in fact, the Belarusian government is already trying to anticipate the shift to electric vehicles. In August 2017, President Lukashenka personally tested and praised the latest Tesla electric car model from the US. The president urged Belarusian developers to use Tesla as an example. That same month, the National Academy of Sciences unveiled the first Belarusian electric car. The prototype is based on the Geely SC7 series, which is assembled in Belarus. Deputy Prime Minister Uladzimir Siamaška noted that with the commissioning of the Belarusian nuclear power plant, Belarus will need to increase its consumption of electric energy. According to Siamaška, in the next three to four years, Belarus will mass produce electric cars. However, if Belarusians want to develop their own electric car, they must hurry. In October 2017, the Russian government sent a letter to all key ministries and state institutions calling for unprecedented measures to stimulate demand for electric-powered transport. The letter spoke of subsidy programs, preferential car loans and auto leasing for electric vehicles. Owners of shopping and entertainment centres will be awarded tax incentives for installing electric recharge stations. In particular, support will be provided to manufacturers of electric vehicles—both domestic and foreign enterprises—who localise assembly in Russia. The letter also suggests the government will set minimum purchasing quotas for electric vehicles for various state institutions. Given that many Russian auto producers have already begun work on electric cars, Belarusians will need to invent something truly extraordinary to be competitive.